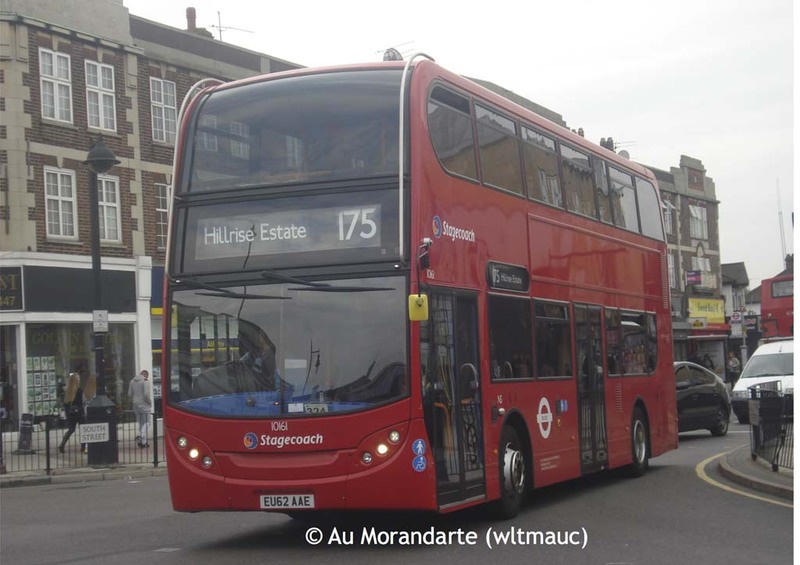 The 175 is scheduled for operation by short wheelbase Tridents, but the Y-registered vehicles previously featured on this page have now been pensioned off. Newer examples have been drafted in, and two views are provided here. Firstly 17854 (LX03 BZH) passes through Romford on Tuesday 5 July 2011. 17539 (LY02&bnsp;OAE) is a slightly older example and has in fact now left the Stagecoach London fleet, but this was such a smashing photo that I had to include it anyway! 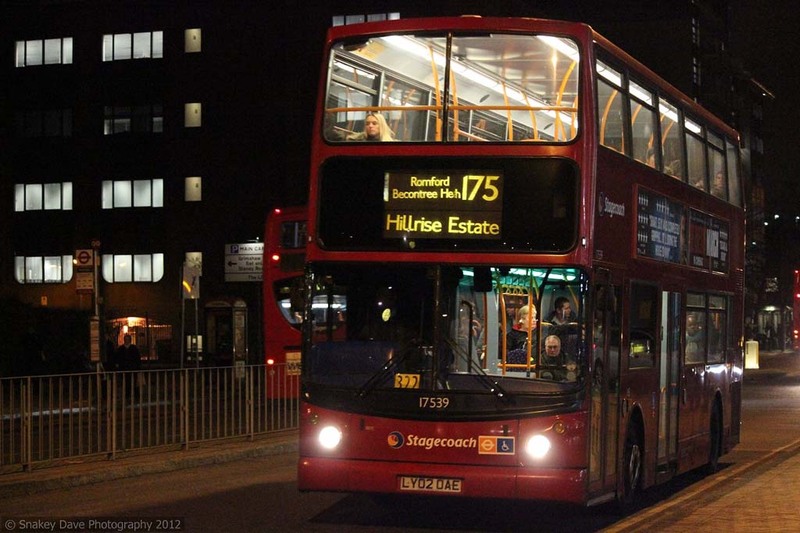 It was photographed in Romford again, on 30 January 2012. Shame about the wonky blinds though. Romford North Street garage, which runs the 175, also has a small allocation of Enviro400s, nominally for route 103 but in practice to be found on other routes. 10161 (EU62 AAE) was seen in yet another corner of Romford, this time near the station, on 28 September 2013, a date when the company took some routes over from First London thereby ending the existance of the latter operator. However, the 175 used to run out into the Essex countryside, its northern terminus being Ongar until 1973. 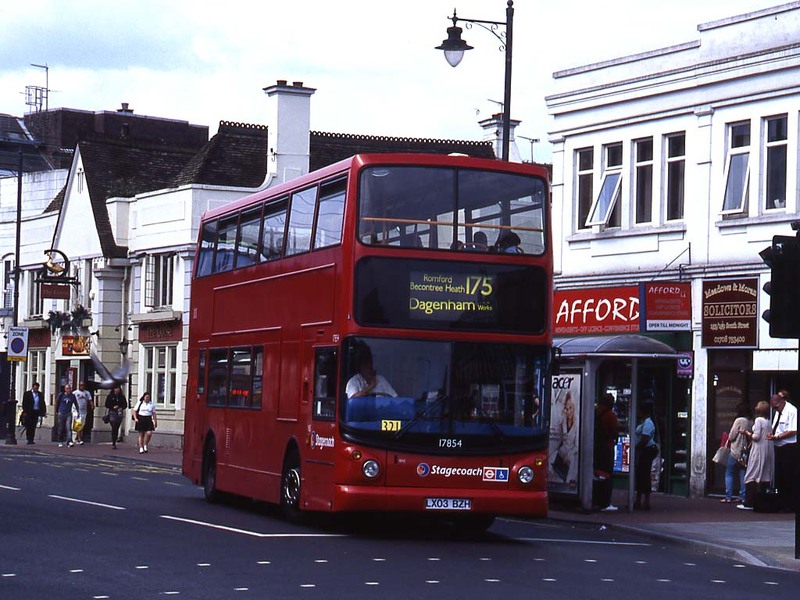 The relatively low frequency section from Chase Cross to Ongar via Stapleford Abbots and Passingford Bridge was then hived off to the 175A (Romford to Chipping Ongar), which in turn was renumbered 247B in 1976, and then reduced from Mondays to Saturdays to Romford Market days only (i.e. Wednesday, Friday and Saturday) the following year. The service was later handed over to London Country who re-numbered it 501; it no longer survives. However, TfL covers the London section and out as far as Passingford Bridge, the number 375 being selected no doubt in a nod to the history of the corridor.